Camp Thoreau is a traditional day camp that features a trip-based mulit-night option for youths not interested in sleep-away camps. We have been enriching the lives of youths for over 60 years helping them gain confidence by having fun practicing the important skills in our character constellation: teamwork, friendships, respect, responsibility and risk-taking. Our Hobby program allows Campers to take ownership of their afternoon activities, so they gain a sense of independence and empowerment over their summer. Group programs including cookouts, day trips and overnights help foster important friendships. Campers build self-confidence and self-esteem being involved in activities that encourage individual learning; unencumbered by athletic or social competition. Our traditional outdoor programming is a wonderful antidote to 'nature deficit disorder.' Campers see the outdoors in their own way and build a healthy respect for the environment. 9am-3:45pm. June 23 - August 15 (no camp 7/4/14). Extended Day is available for $150/week from 7:30am to the start of camp and from the end of camp to 6pm. A full-day session (2 weeks): $1325. Adventure Camp - a trip-based multi-overnight camp for kids 4th-9th grade: $1800/session. CIT Camp (4 weeks): $2400. Half-day camp for kids entering Pre-K: $750. 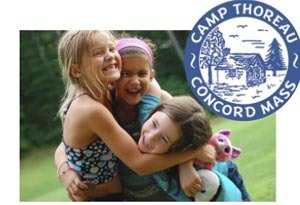 Camp Thoreau believes that every child should have the opportunity to experience camp. To emphasize our dedication, we will award 4 new campers each 1 session of camp. at Youths entering K - 6th grades are encouraged to enter by April 4, 2014.